Fortnite is the largest video game on the market at the moment. The craze is bigger than fidget spinners and doing the Tide Pod Challenge ever were. Epic Games has officially kicked off the battle royale shooter’s fifth season. This new season is offering new locations, weapons, and vehicles. Fortnite is beginning to take a step into the golfing world. In the newest season they will be adding new golf greens to the map. Not only golf greens but golf carts are all going to be featured. Although they do not call the vehicle a golf cart, it is known as All Terrain Kart (ATK). 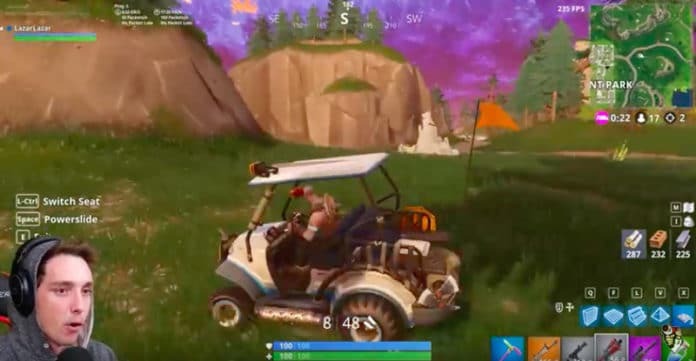 The ATK is basically a upgraded golf cart. It enables speed boosts when drifting. It was created so all four members of the squad can hop inside, but also enough, the roof acts as a bounce pad.